The Veggetti will change your world â and your waist size. It is available at Rite Aid in the âAs seen on TVâ section. How could this happen? Here I was, trying to make slimming noodles out of vegetables, and they were not good. I shredded them, patted them dry, refrigerated them before preparation and, still, not good. It took me some time to get over that. But with the Veggetti going for $14.95, what did I have to loose? Nothing. In fact, I gained everything. This little device is my new staple, especially in summer. In fact it is so marvelous all my friends have been gifted with this gizmo which means, not only is my secret out, but they are now using it and may not invite me to their potlucks. Well, I now own stock, so you better remember where I came from, missy. The thing that is great about the Veggetti is it really does make fettuccine noodles exactly like the real thing, but with only about 10 calories, one carbohydrate, zero fat, and ample fiber. The “noodles” are so perfect they last in the fridge for several days. I just use them in any pasta recipes. That, again, is amoré — I only use that when I mean it. 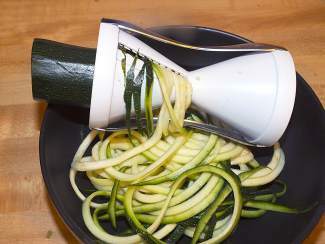 Using Veggetti fettuccine attachment, follow instructions (super easy) and set new “noodles” aside. I sometimes cut them in half at this point because they are huge, almost a yard long, and thus, difficult to work with. In a large skillet heat about 1/4 cup of chicken broth over high heat. You want to get it to a hot temperature before you add your garlic. Once it is simmering, add garlic and stir until aromatic. Reduce heat to medium and then add onions until they also start to give out a nice aroma. Add faux fettuccine (that would be your amazing zucchini noodles) and another 1/4 cup of chicken broth. The weird thing about these “noodles” is that really don’t sweat very much. They seem determined to be pasta! Next add tomatoes and capers. At this point you can cover all for about ten minutes. I would maybe serve it with a side of roasted chicken, but it is healthy and good on its own merit.